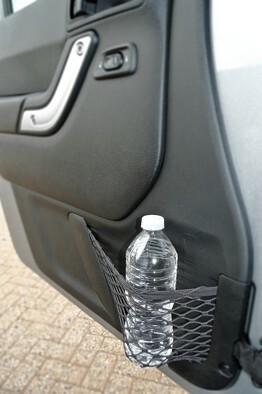 Jeep designers got inspiration for this in-door net when they peeked in car windows and saw a bottle secured with a bungee cord. Here is a Wall Street Journal article (July 18, 2013) you may find interesting. In it, we find that Chris Shinouskis, whose title is “Engineering Specialist for Storage” at GM, is one of a handful of designers who carve out compartments to hold the ever-growing array of items people bring into their cars. Adding storage can be a hard-fought battle, especially as cars today come crammed with high-tech safety, information and entertainment systems, all of which require space-hogging wiring and hardware. But buyers are demanding it–65% of new-car buyers said interior storage is “very” or “extremely important”– as they spend more time on the road and bring their tablets to stay plugged in. Complicating the storage challenge is the fact that it can take 4 years to develop or completely redesign a model, while the technology world moves much faster. For example, Apple offered 4 generations of its iPad tablet in under 3 years. Matt Rutman, a Ford storage specialist, was adamant that the new SUV needed a place, right above the shifter, for mobile-phone storage and charging. “I was told it wasn’t possible,” says Rutman. “So I went back to my own computer and figured it out myself.” His solution involved redoing the ventilation system behind the dash, and moving up the video screen and controls. The glove compartment, in particular, often becomes catchall for junk, so Chrysler has just designed a glove box in its new Dodge Dart deep enough to fit a small laptop or tablet. To make it fit, Chrysler had to mount the heating and cooling unit vertically, instead of the normal horizontal fit. With the importance of drinks and cell phones, the 2014 Chevy Malibu offers two cup holders and two cellphone cradles, one each for the driver and the passenger.